Fig. 178. Lavenham, Suffolk. - The Woolhall, East Front. Mid-fifteenth century. Fig. 179. 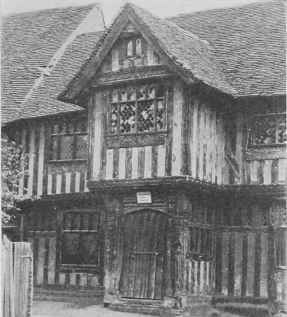 Paycockes, Coggeshall, Essex. - Late fifteenth century. Noel Buxton, Esq. Fig. 180. Lavenham, Suffolk. - Houses at corner of Lady Street and Water Street. Mid-fifteenth century. Fig. 181. 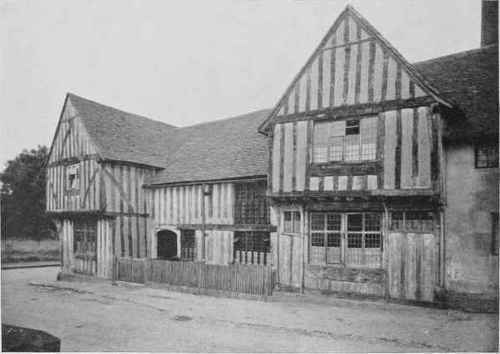 The Guild Hall, Lavenham. - Porch and projecting Bay. Fig. 182. 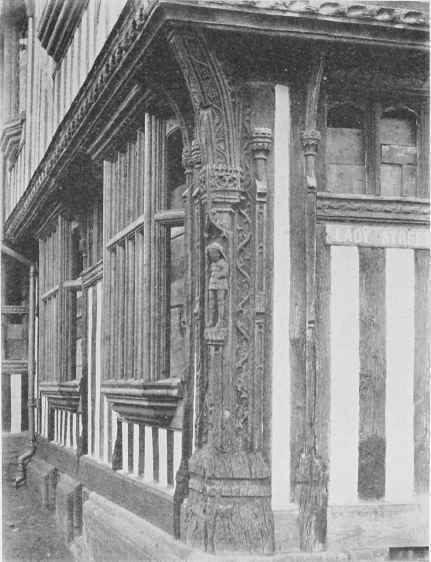 The Guild Hall, Lavenham - Detail of Porch. Fig. 183. 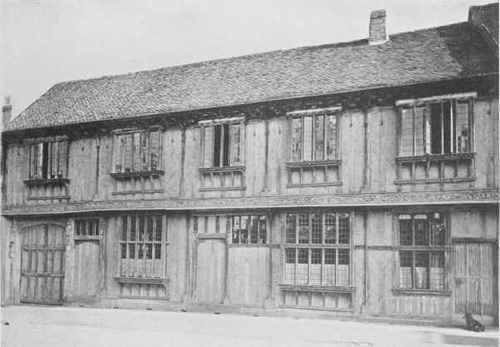 The Woolhall, Lavenham. - Detail of Corner-post. Fig. 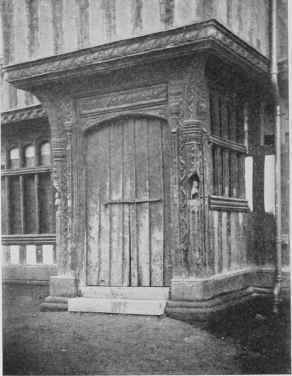 184, The Guild Hall, Lavenham. - Detail of Corner-post. 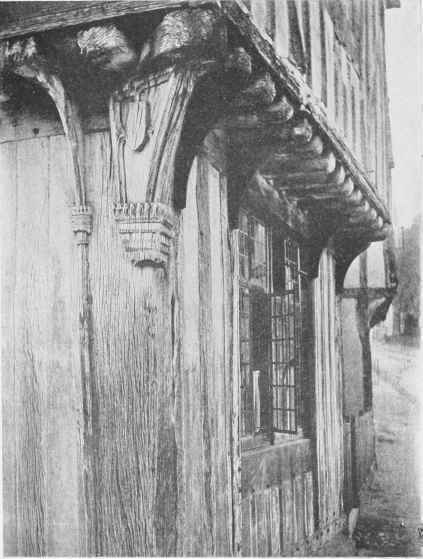 Beside these evidences of love of, or reverence for the Church, which inspired the mediaeval craftsmen to give of their finest without reward, we see, in timber houses of the elaborate East-Anglian type, similar signs of work being done for the sake of the community, much of which must have been a labour of love. The chief point which strikes the student of the work of this period, is its conscientious character. Nothing is scamped; nothing left to chance. Joints are made as carefully in unseen positions as in work which is fully visible. 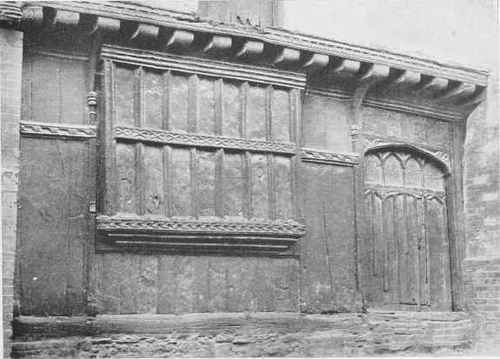 Even the wood is sawn in the best manner, as described in the chapter on " The Early Woodworker," whether figure in the oak be desirable or not, simply from the knowledge that quartered oak is more durable than that cut across the trunk or log, in the obviously economical manner. When paint is removed from fifteenth-century work, where it has remained from the time when it was first completed, we find the ray figure in the wood, with the " splash " darkened nearly to black by the action of the lead. 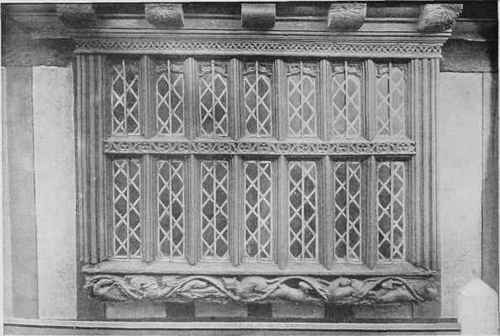 This oak was never intended to be left bare; yet it is prepared just as carefully as if the piece had to rely on the figure of the wood for its decorative effect. Fig. 185. Oak Corner-Post. - 7 ft. 3 1/2 ins. high, 15 ins. wide across cap. Mid-fifteenth century. Fig. 186. 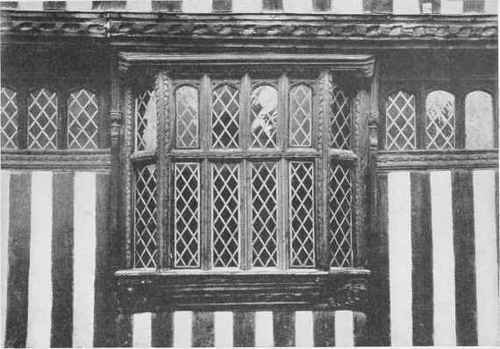 Lavenham Guild Hall, Bay Window. - About 1486. Fig. 187. 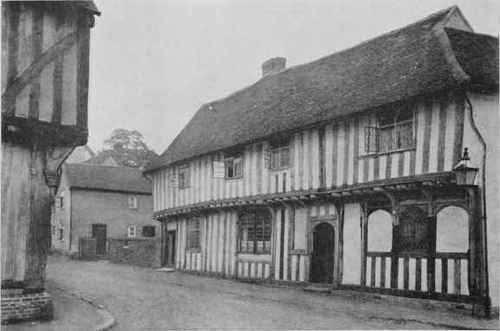 House In Lavenham, Suffolk. 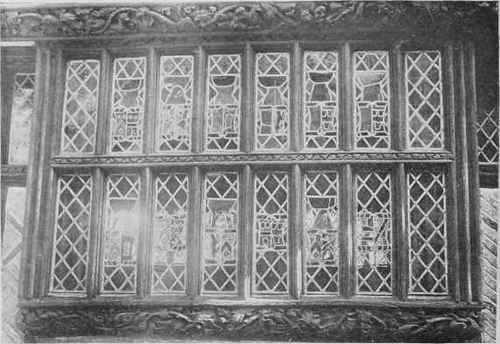 - Square Bay with Mullioned Window and Entrance Door. Figs. 188 and 189. Alston Court, Nayland, Suffolk. - Bay Windows. Late fifteenth century. - A. M. Fenn, Esq. Figs. 190, 191 and 192. Boxford Church, Suffolk. 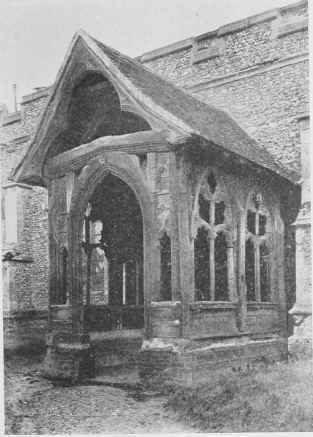 - Porch of heavy timbers, with interior vaulted and ceiled; unique example in England. 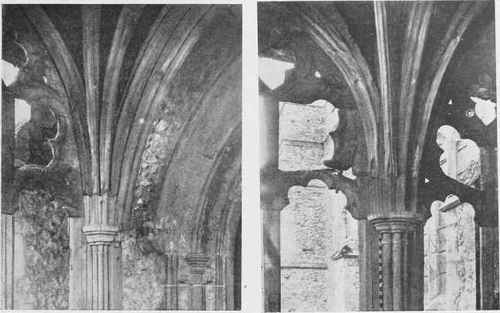 Saint's niche above tie-beam missing, but mortise still visible in collar-beam between trefoil of head. - Mid-fourteenth century.